CannabisNewsWire Editorial Coverage: A wave of acquisitions is sweeping the cannabis sector, as increasing legalization draws the attention of big business. Large and mid-tier cannabis companies are absorbing their smaller competitors. Tobacco and alcohol companies are moving in as a natural extension of their current ranges. This is supported by growth not just among cannabis growers but also for businesses supporting them. Cultivation supplies company Sugarmade, Inc. (OTC: SGMD) (SGMD Profile) has recently announced the acquisition of hydroponic product companies that could more than double its revenue. Tilray, Inc. (NASDAQ: TLRY) is fueling expansion through an initial public offering as it begins its first sales of CBD oil products in the United Kingdom. Drinks giant Constellation Brands now owns a large chunk of Canopy Growth Corp. (NYSE: CGC), one of Canada’s largest cannabis companies. GW Pharmaceuticals Plc (NASDAQ: GWPH) is releasing fresh shares to fund its R&D-driven growth. Meanwhile, Aurora Cannabis, Inc. (OTCQX: ACBFF) is making acquisitions across the Atlantic, buying out a pair of European hemp companies. Twenty years ago, it would have sounded like a science fiction fever dream, but today the cannabis industry is one of the fastest-growing sectors in the North American economy. The nine U.S. states where recreational cannabis is legal are about to be joined by the entire country of Canada, while another 20 states have legal markets for medical marijuana. Businesses catering to these markets are going from strength to strength, whether selling cannabis, manufacturing products derived from it or providing the tools and support that growers need. This has led to a flurry of mergers and acquisitions in the cannabis sector. At the top end, large companies from other sectors have started buying into cannabis. Beverage manufacturer Constellation Brands owns more than a third of the shares in Canopy Growth, Molson is working with Hydropothecary, and Phillip Morris has been talking about moving into the sector. Seeing another legal drug coming into play, tobacco and alcohol companies want to buy their part of the future. And there’s also been a lot of movement within the industry. Among existing cannabis companies, consolidation is the name of the game. A wide scatter of small companies — startups created within a new and uncertain industry — are combining into larger operations. One example is a recent series of acquisitions by Sugarmade, Inc. (OTC: SGMD). A Los Angeles company with warehouses in southern California, Sugarmade isn’t a purely cannabis-oriented business, but its work in restaurant supplies and packaging is increasingly taking a back seat. 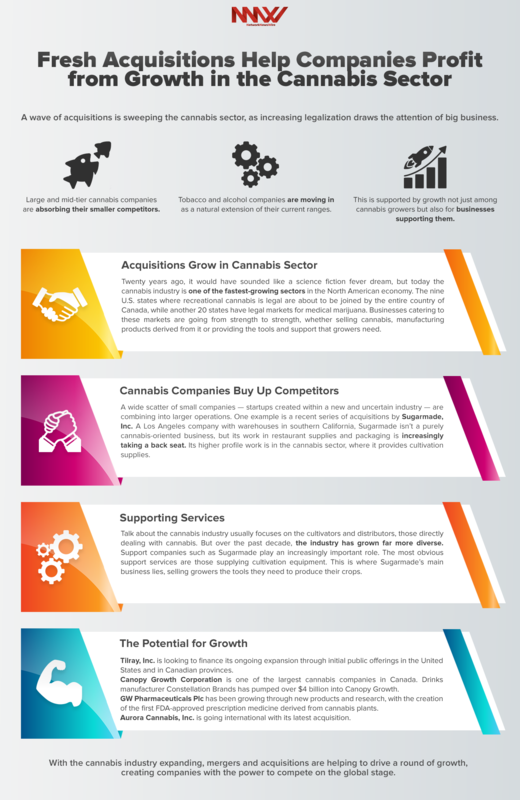 Its higher profile work is in the cannabis sector, where it provides cultivation supplies. Sugarmade isn’t one of the big players in cannabis, but it has made bold moves for a mid-tier company. Following an SEC filing earlier this year, the company has recently made formal proposals for the acquisition of two hydroponic supply companies catering to the cannabis sector. These acquisitions would more than double Sugarmade’s expected revenue for next year, from $30 million to $75 million. Even within the cannabis industry, this is an unusual move. Most of the mergers and acquisitions are being led by big companies, who can obtain external investment to drive their expansion. It’s a familiar case of success breeding success, as the largest companies are most able to grow. But Sugarmade is bucking that trend in a move that could see it join the big players, disrupting the status quo of the cannabis industry. It’s a strategy that brings a lot of obvious advantages. Greater integration smooths out supply chains and increases efficiency, reducing overheads to improve profits. It increases a company’s ability to bring specialist expertise in house. It increases a company’s influence in negotiating with suppliers and customers, as well as in lobbying authorities. But in a sector where mergers are likely to continue, it also has another effect. As the big players in tobacco and alcohol look for cannabis businesses to buy, Sugarmade’s growing strength improves its bargaining position. Whether the company aims to be bought up or to hold onto its independence, it will be better able to negotiate from a place of strength. Talk about the cannabis industry usually focuses on the cultivators and distributors, those directly dealing with cannabis. But over the past decade, the industry has grown far more diverse. Support companies such as Sugarmade play an increasingly important role. The most obvious support services are those supplying cultivation equipment. This is where Sugarmade’s main business lies, selling growers the tools they need to produce their crops. Hydroponics, the growth of plants in water-based nutrients instead of soil, is an important part of this. Used to grow high-quality plants in indoor facilities, this method is central to the cultivation of controlled, high-quality cannabis crops in secure conditions. Hydroponic sales have allowed Sugarmade to expand beyond North America and into the European market, where cannabis is still largely illegal but its cultivation tools have other uses. The companies Sugarmade is buying also work in hydroponics and their acquisition could make the company a major player within that market. Support services for cannabis are increasingly diverse. Equipment for waste disposal, lighting and growing beds are all important. Some of this is provided by hydroponics companies, while other components are created by specialist firms. Seeds are nurtured and sold, new plant strains grown, and growing and harvesting techniques developed. Research and financial services specifically geared toward cannabis add to a complex and multifaceted industry. Much as its opponents might disagree, the cannabis industry isn’t going away. In the United States, where Sugarmade is based, the industry shows every sign of continuing its rapid growth. The biggest driver for growth is still legal change. The legalization of both medical and recreational cannabis has been spreading state by state, as increasingly liberal attitudes are reflected in the law. Though cannabis remains illegal at the federal level, the government has done nothing to clamp down on these efforts by states. If anything, the government’s attitude is softening, with this year’s Farm Bill set to legalize industrial hemp, a nonpsychoactive form of cannabis. Industrial hemp is already being grown in test projects in the United States, creating impressive profits for the farmers involved. While its cultivation often operates differently from that of medical and recreational cannabis, it relies on much of the same knowledge and many of the same tools. For companies such as Sugarmade, which provide cultivation supplies, industrial hemp will mean significant opportunities for growth. On top of this, there’s the long-term growth expected from cannabis companies within the states that have legalized their products. As the legal consumer market settles in, the habits of cannabis consumers will change. They’ll move away from buying from criminals, undermining illegal networks and giving more business to the legal companies. As these companies expand production facilities, the need for additional equipment and supplies will increase – supplies that can be provided by Sugarmade and the companies that it’s absorbing. Many North American cannabis companies are seeing substantial growth. Tilray, Inc. (NASDAQ: TLRY) is looking to finance its ongoing expansion through initial public offerings in the United States and in Canadian provinces. A leading medical marijuana company, Tilray has sold its products to customers on five continents and is one of the first companies to sell CBD oil, a cannabis derivative, in the United Kingdom. Its expansion is driven not by acquisitions but by a strong research and development program. Canopy Growth Corporation (NYSE: CGC) is one of the largest cannabis companies in Canada. Drinks manufacturer Constellation Brands has pumped over $4 billion into Canopy Growth, and the American giant now owns more than a third of Canopy Growth’s shares. It’s a move that will help the companies to collaborate in producing cannabis-infused drinks, which will become legal in Canada next year. More than this, it’s a move by a drinks manufacturer to get a foothold in cannabis and so expand from alcohol into another legal drug. GW Pharmaceuticals Plc (NASDAQ: GWPH) has been growing through new products and research, with the creation of the first FDA-approved prescription medicine derived from cannabis plants. It has just announced the release of new shares, which are expected to raise $300 million in support of the company’s ongoing growth. Aurora Cannabis, Inc. (OTCQX: ACBFF) is going international with its latest acquisition. In September, the company acquired Europe’s largest producer of organic hemp, Agropro UAB, and hemp processor and distributor Borela UAB. This will increase the company’s production of hemp-derived health and wellness products around the world. With the cannabis industry expanding, mergers and acquisitions are helping to drive a round of growth, creating companies with the power to compete on the global stage.